Happy Thursday lovelies! Sorry for my absence yesterday, after my extremely long day of meetings (although extremely fun ones!) on Tuesday and not having access to a computer all day I ended up going home and answering e-mails from work then by the time I was done it was around 8 pm and I was exhausted so I needed a break. I guess a 12 1/2 hour day will do that to you! Ok, so now that I'm back and refreshed, let's talk about hair. I've always had thin, fine hair but as I've gotten older I'm convinced it's gotten thinner. Of course these things happen so I shouldn't be surprised but it has been a bit frustrating to deal with. Then I discovered the magic of clip in extensions and the fullness they could bring to my hair and I've been sold ever since! Lately these IrresistibleMe hair extensions have been my go-to for long, thick, luxurious hair. I decided to go with the 20 inches, 200 gram Royal Remy line in Royal Medium Brown. I went with the Royal Remy line because it's the closest you can find to completely unprocessed hair and it's the same from the top to the bottom of the weft giving you body throughout the entire weft. 20 inches is quite a bit longer than my natural hair length since I recently chopped it all off but these extensions blend extremely well with my natural hair and are surprisingly close to my hair color. The Royal Remy 200 gram set comes with 10 pieces total - 1 super thick weft of 4 clips, 2 pieces of 3 clips, 5 pieces of 2 clips and 2 pieces of 1 clip. The wefts are so naturally thick that I usually don't even wear all 10 pieces at once. I'm only wearing 4 of the extensions in these pictures and you can see the huge difference they made. I usually start with the 3 clip weft as close to the bottom of my hairline as I can get them then above that I used the 4 clip weft. Then I used two of the 2 clip wefts for the sides of my hair pinning them just above my ears and at a slight diagonal to give that natural angle look. When I want a bit more volume or when I wear my hair straight I'll throw in the second 3 clip weft just below the 4 clip and above the other 3 clip weft to add in more "layers". I love that the IrresistibleMe extensions come in so many different options and colors so there really is something for everyone, no matter what type of hair you have and what you're looking for. 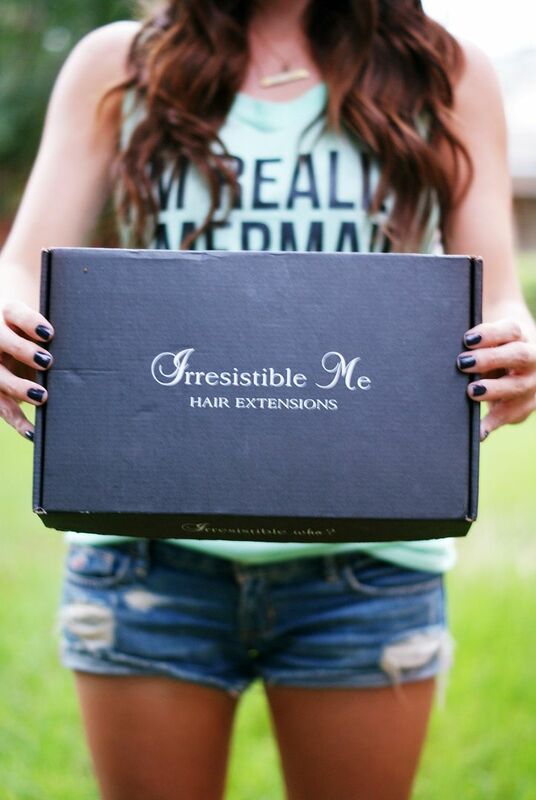 I was gifted a set of IrresistibleMe hair extensions for review. All opinions are 100% my own. Oh my gosh these look gorgeous on you! They look so natural! So glad you shared! The extensions look gorgeous!! When they contacted me, I chickened out on the extensions and went for the wand instead but I love how natural yours look! Wow!!! I love how this looks on you! You may have me considering these because you look fab! These look SO pretty and natural Pamela! The color blends in perfectly with yours! You look fantastic! I have fine hair - so a lot of it, but it's not thick by any means. I've always wanted to try extensions but for some reason I haven't bit the bullet yet. I just need to do it. Love how full your hair looks! Love the longer hair on you. It looks so natural! Thanks for sharing. Glad you got some needed rest! Your hair looks amazing and the color matches so perfectly!!! They look so amazing on you!!!! The volume they gave is unreal! The color matches perfect too! So pretty! What a difference they make and they look so natural! Gorgeous! The extensions look so natural! Wow those are beautiful! I've been thinking about getting some extensions for a while now to bulk up my hair every now and then and these are so pretty! Wow!! You can't tell that its not your hair at all! Did they feel heavy or hurt your head after wearing them for awhile? Wow, you never know those were extensions!! They blend perfectly!!! Uhhh...can't even tell you're wearing extensions. Those blend great! GORGEOUS!! You are doing it right with those extensions!! The amount, the length, the color- perfection! Also, I really need that tank! 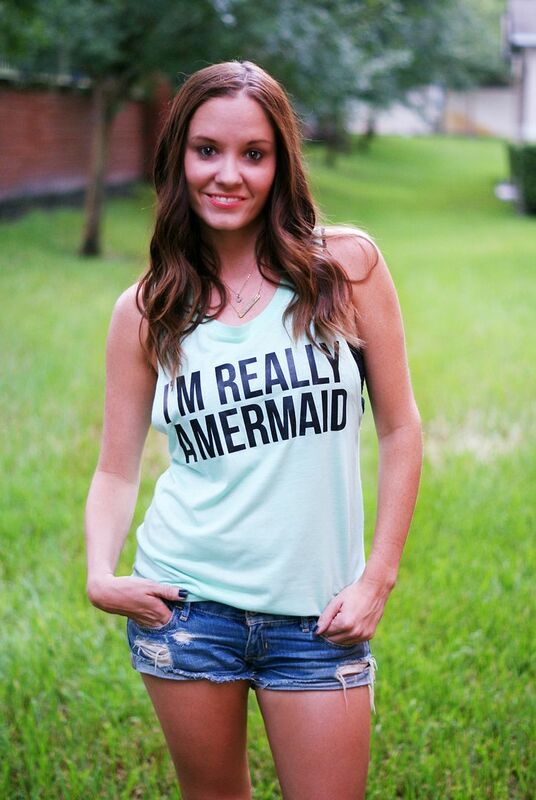 You are just the cutest mermaid out there, lady! Love the extensions, you'd never know they weren't your real hair. You look fabulous. These look great! So natural!!! I've been toying with the idea of trying some extensions but there are so many diff kinds! Wow they really do make a big difference. Love how they make your hair look! Hope you got to rest up after your long work day! Love how natural they look, look at all that volume! And they seriously perfectly match your hair color! Wow! Those look great on you and really blend in with your hair! 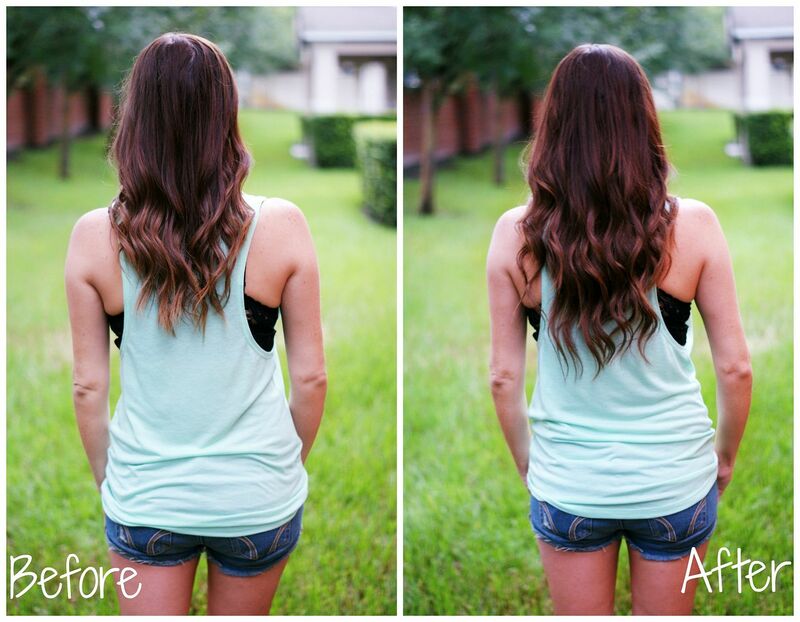 Your hair looks gorgeous in these photos! I'm still playing around with my extensions from the same company - I've never used hair extensions before this, so I don't really have a clue what I'm doing. Thanks for explaining how you clip yours in! It looks great, I can't even tell. Do you find them easy to put in? I'm lucky enough that I don't need them, but still cool to see others wear them. My best friend needs this shirt!!! 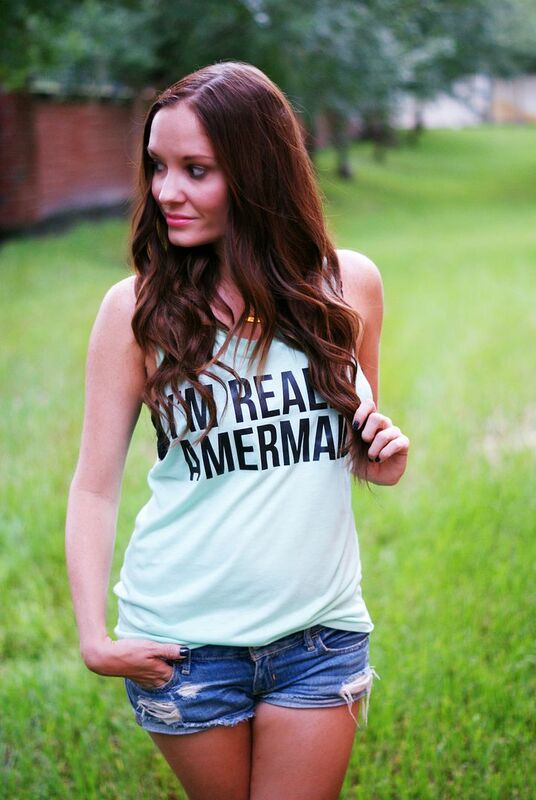 Those definitely are getting you one step closer to Mermaid girl status ;-) Those look fab on you! They look so natural! You look gorgeous. Wow, I chose the same colour! But they don't match my hair colour perfectly, so have been using them as highlights! Your hair looks gorgeous after using the extensions!!! Wow gorgeous!! They look totally natural, I never would have guessed they were extensions! gahhh these look AMAZING. your hair always looks fabulous, i would never guess it was fine and thin. and that top - adorable. Your hair looks absolutely amazing!!! Maybe I need to look in to these! My hair keeps getting thinner and thinner as well. Also, the way the sun is hitting your hair color in these pictures is so pretty! I got the IM extensions too! Aren't they amazing? I wear extensions on the daily (well almost) and these were extremely impressive. You look great as well, they match your hair perfectly.